One of the reasons that people love to move to Arizona is that the state enjoys nearly year-round sunshine. It may rain during the monsoon season and even get cold at certain times or at certain elevations, but the sun is never gone for long and neither is the heat. But the sun can become positively unbearable during the summer, not only for the people living there but also for the properties. Arizona’s summer sun can take a toll on your roof. It can cause damage that you may not even know is there until a monsoon hits and you’ve got water pouring through the ceiling. Hiring a roofing contractor in Peoria to do a yearly inspection can help prevent these problems, but it’s also important that you know how the sun can be problematic for your roof. Knowledge is power! The sun is key to breaking down organic materials, many of which are used in your roofing materials. The heat and the UV rays from the sun can cause elements in your shingle, underlayment, wood, and even your tile to slowly break down over time. You may not even notice the progression of the damage until there’s an obvious problem. But small cracks can form and the materials can become more porous, allowing water to penetrate and reducing the effectiveness of the roof overall. Extreme temperature changes also cause materials to expand and contract. Over time, all that movement can cause the materials to dry out, to degrade, and to break. Tiles can crack, shingles can degrade granule by granule, and tar paper and underlayment can dry out and wear away. All of those damages can allow leaks to penetrate and cause your energy bills to soar. Finally, the sun can cause some roofing material to blister or warp, which can cause small lumps or unevenness to form on the roof. That will reduce the top layer of coverage, which will make the underlayment vulnerable (as well as your home). In most cases, a contractor will be able to perform a Peoria roof repair for the damages by replacing the worn out or defective materials. You have warped shingles; your roofing contractor will replace those shingles. You have worn out underlayment; your roofer will replace the tile and the underlayment below it. However, it may be that the reason your roofing material has become damaged or worn out is because it was not designed to stand up to the harsh Arizona climate. Your roofer will inspect your roof and let you know if the materials are inadequate for the climate and whether you should consider total re-roofing instead. Continuing to make repairs might be like trying to scoop buckets of water out of a sinking boat. There’s no need to keep throwing away money repairing a roof that is destined to fail because it was inadequately designed. Some damages are just too severe to make it worth it to repair your roof. You may need to re-roof entirely, or you may just need to gird yourself for an outrageous roof repair bill. Severe damage involves extensive swaths of your roof. If more than a small area has to be repaired, you’re looking at a lot of money. Severe damage also includes damage that penetrates multiple layers of your roof, including the underlayment and subdecking. Again, the larger the area, the more severe the problem. Finally, you may also need to consider re-roofing if some of the roof damage is caused by improper pitch or other design flaws. Only a qualified roofing contractor in Peoria can let you know if this is the case, so make sure you always get an inspection before you schedule repairs or try to start tinkering around on your roof yourself. It’s always the best idea to get regular roof inspections to determine whether your roof has any damage or any potential problems. Schedule your inspection for just before or after a season. For example, you may want to schedule an inspection before monsoon season starts so that your roof is strong enough to withstand it, or you may want to schedule your inspection for after the summer to see if the sun has caused any damage. 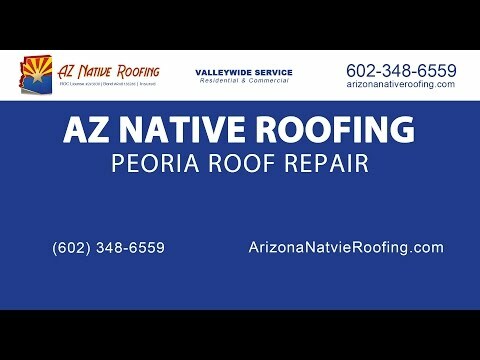 AZ Native Roofing are experts in Arizona roofing needs. Call us to have a roofing contractor inspect your home or business to ensure that your roof is in top shape to protect your property from damage and to keep your energy bills low. We’ll let you know if roof repair is your best option or if you need to consider re-roofing. Contact us in Arizona for a free estimate! Why is Sun City Roof Repair so Expensive?